After my accident I learned very quickly you must be your own advocate. No business even government run or medically related is going to look out for your best interest. At best they will do the minimum, if that. One of the hardest parts about advocating for yourself is simply getting a human on the phone! 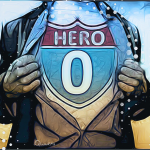 Here is a trick just keep hitting 0 at every prompt of the automated service line until it finally connects you to a human and that’s how zero can be your hero! FYI: these systems are setup for you to not be able to talk to a human and they are getting savvy enough that the zero trick won’t work. Here is another trick, intentionally call the wrong department, like sales (they always pickup) and ask for a direct contact in the department you really want. I hope these quick tips are helpful. GOOD LUCK! This entry was posted in Advocacy and tagged advocacy, Advocates, disability, healthcare, insurance, social services, traumatic injury, Voc rehab. Bookmark the permalink.